A story from the desert southwest gives one retired woman renewed sense of purpose and direction for ministry to others. I read an essay years ago that resonated with me so powerfully that it moved me to begin my “retirement” ministry. Recently, I have felt the need to revisit it because I have had profound doubts about what exactly it is I am to be doing as I sit upon this planet right now. So much of the pain that I see in the world seems so far beyond my reach that I ache…and yet I ache nowhere near as much as those who are suffering. I best not let that ache stop me but some days even this 71-year-old cockeyed optimist wonders if anything she does makes any difference. I remember sitting reading this with a lump in my throat. Douty was describing me (and it resonates even more today). But then she said she realized that this saguaro (who was referred to as SHE) was always pointing UP! And, even more significantly, she realized that where the wounds were exposed, and it was eaten away, the birds had built nests. Brought tears then and brings them now. That cactus knew what she was to do while sitting upon this planet: SHE had a purpose ‘in the midst’. And. So. Can. I. …and I can LET OTHERS BUILD NESTS IN MY WOUNDS! When I read that years ago, I felt the gentle nudge to begin a modest ministry to persons who needed a “safe place to reflect.” It is also when I knew that in my retirement I wanted to try to keep on pointing UP no matter where I was sitting … at home with Joe, in humble huts across this world, with friends and family, beside those I am yet to know at a shelter, a restaurant, an airport … yadayadayda …. wherever, however, whoever, whenever! 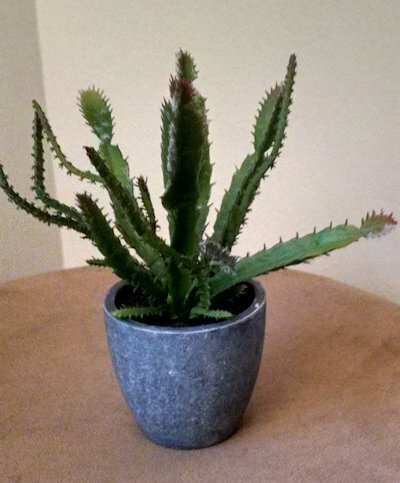 …and this little cactus (thank you, Nancy) reminds me each day to NOT let that go. But, truth be told, I wonder sometimes HOW to continue to offer myself up. 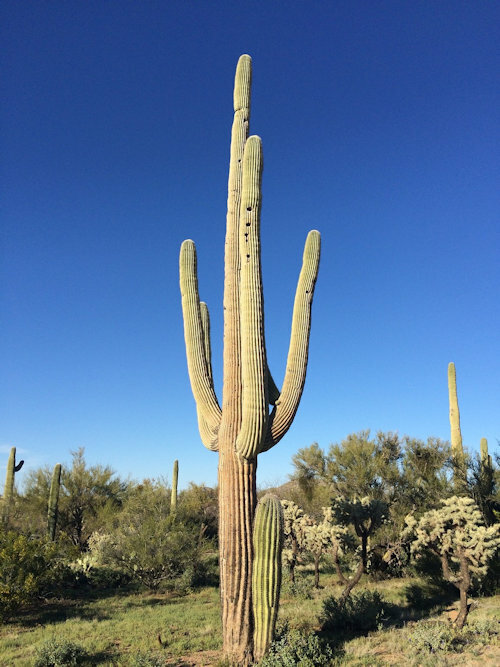 Plain, barren, ugly ain’t a pretty descriptor for a cactus or a human. But if that old cactus can have a “ministry” then so must this old gal. So, I am once again putting this in writing to hold myself accountable. 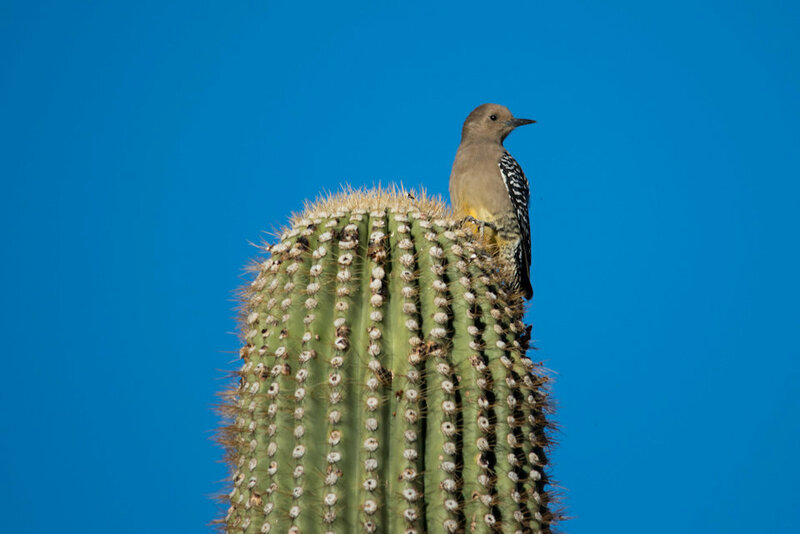 Like my sister saguaro, I can always point up, and I can always let others build nests in my wounds … no matter how old I am … no matter how much I ache … no matter where I am sitting on this planet. Wounds mean there was love, and tears mean there is life so, Nest Builders, here I am! Just look for the ol’ “ugly” one pointing UP! ~ Cheryl Bistayi is a retired social worker living in Novi, Michigan. This November 27, 2018 edition of her blog, “Meanderings,” reprinted with permission. Cheryl invites anyone who might need a “nest” to befriend her on Facebook or email at cjbistayi@yahoo.com.